The HoloSpec from Andor is the perfect solution for gathering more light and gaining better signal-to-noise ratio in a faster manner, which is vital for applications such as microfluidics, real-time medical diagnosis (point-of-care analyzers), micro-Raman mapping, or stand-off bacteriologic agents or explosives detection. 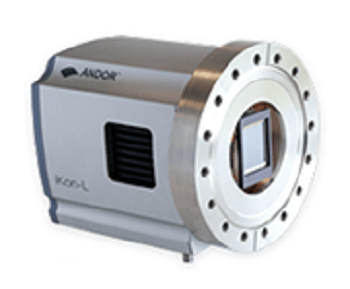 The superfast F/1.8 Andor HoloSpec spectrograph offers outstanding light collection efficiency capabilities, and provides an ideal match to Andor’s ultra-sensitive EMCCD, CCD, and ICCDs detectors, offering the highest sensitive and versatile detection solution on the market for visible or near-infrared spectroscopy. The HoloSpec offers aberration-corrected optics for superior multi-track capabilities, enabling high-density fiber optics simultaneous acquisitions with extremely low crosstalk, even on narrow spectroscopy sensors. It is a suitable tool for tough industrial or in-the-field applications. It also offers research-grade performance, ideal for academic research.